Liquitex Texture Gels are of medium viscosity, and contain specific aggregates, which produce a variety of unique textural, dimensional, and reflective effects when mixed with acrylics. They can be intermixed to increase possible texture variety. Blended Fibers — A thick, fibrous gel that when dry gives the effect of flexible fibers with a matte sheen. Great for adding texture and body, it holds unusual peaks and knife strokes when mixed with color. Works best when applied with a palette knife or trowel. 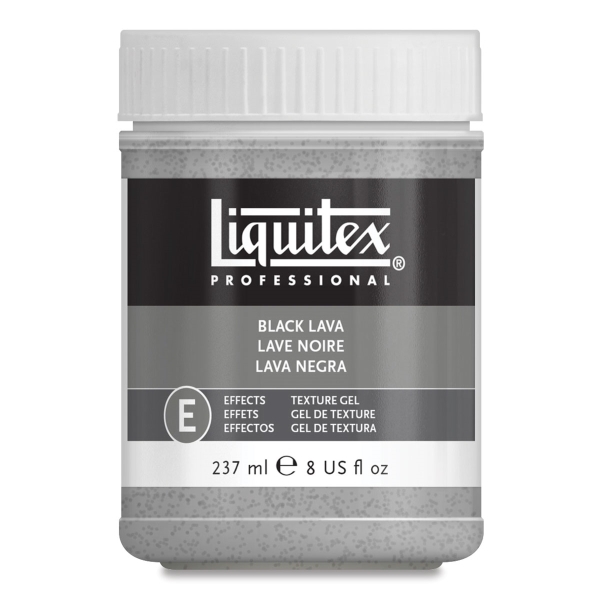 Black Lava — This black speckled gel contains small, flat hexagonal shaped dark aggregates. Gel appears gray when wet, but gives the effect of ground, dry, black lava when dry. The black, textured quality of this gel is most apparent when it is mixed with transparent or translucent colors. Ceramic Stucco — This fine textured gel is thick and low luster, drying to a light gray matte finish. Use it to produce thick three-dimensional effects, as well as for thinly coating surfaces. It provides an excellent ground for acrylic and oil paint, oil pastel, oil bars, pastels, and graphite. Ceramic Stucco gel is somewhat susceptible to abrasion, so added protection can be provided by coating with Liquitex varnishes, applied carefully to avoid foaming and clouding. Works well with brush application. White Opaque Flakes — This heavy body, coarse gel contains irregular sized and shaped opaque flakes. This white flake texture is most apparent when mixed with transparent colors or small amounts of opaque colors. Natural Sand Fine — This is a finely textured gel that dries to a surface similar to glossy beach sand. It can be mixed with colors to improve blending and impart the feel of oils, and is also a very effective ground for acrylic and oil paints, oil pastel and graphite. Resin Sand Coarse — This is a thick, coarse, texture gel that contains aggregates of various sizes. It dries to a rough cement look and will retain its texture when mixed with paint. Also an excellent ground for acrylic and oil paint. 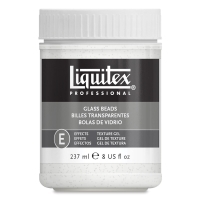 Glass Beads — This medium body gel contains clear, round aggregates that dry to a semi-gloss, reflective surface that appears "bubbly." It yields its most dramatic effects when mixed with transparent or translucent colors. It can also be applied over dry paint. 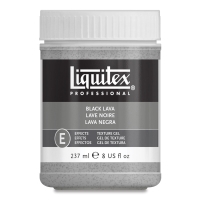 For reflective textural glazes, mix with Liquitex Gloss Medium and Varnish and small amounts of Liquitex Medium Viscosity Concentrated Artist Color. This gel is suitable as a ground for acrylic and oil paints, and works well with brush application. Liquitex Texture Gels are formulated for maximum flexibility and adhesion, and will not crack or chip on canvas. Use them on both rigid and flexible supports. Texture Gels can be applied to the same materials and surfaces as traditional acrylic paints. They are lightweight, and they dry to a water resistant, non-yellowing surface.